The Dead Zone, a novel by Stephen King, is a horror story published by the author in 1979. The plot revolves around one Johnny Smith, who enters a five year coma following an accident and, when he emerges from the coma, he can see the futures of people that he touches. But, there are some things that he can’t see clearly because of his ‘Dead Zone’, an area of his brain that is still damaged from the accident. The Dead Zone was Stephen Kings seventh novel and, following the successful publication of his immensely intricate and interwoven book The Stand, a few years earlier, The Dead Zone saw king revert to a cast a far fewer characters and a far less complex plot. 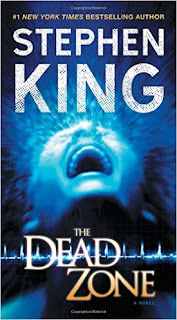 In an interview, some years after publishing The Dead Zone, King said that he felt that the book was his best to date and described it as a real novel with a layered texture and a thematic structure. The book, nominated for the Locus Award in 1980, is set against the historical backdrop of the 1970’s and it has been said the Stephen King may have got his inspiration form the real life story of Peter Hurkos, a self-proclaimed psychic who claimed to have gained the gift of psychometric after an accident falling from a ladder. The Dead Zone is a perfect example of what makes Stephen King such a good writer and a writer who takes horror to a new level. Whereas most horror fiction writers deal with the external threat of zombies banging at the door or vampires hiding in the shadows, many of the Kings’ books focus on the horror that is within, taking what at first appears to be a relatively normal person and transforming them into a monster. Many people believe that Kings’ infatuation with this man into monster theme at this time in his life was a reflection on what his alcohol and drug addictions were doing to King personally. Stephen Kings’ The Dead Zone cleverly weaves horror, psychic abilities and a bit of political intrigue into one believable tale and finds Johnny Smith eventually on a mission to kill politicians and one in particular who, he believes, through his physic visions will be responsible in the future for starting a nuclear war. Some Stephen King books could be accused of being over-written with the level of detail that they go into, but the Dead Zone is early King at his best, lean, mean and to the point. The book was adapted for the big screen in 1983 by screenwriter Jeffrey Boam into the David Cronenberg film starring Christopher Walken and Martin Sheen. There are some changes to the plot in the film, but it still manages to convey the tone of the novel and the change in Johnny’s personality brought about by his powers. There was also a TV miniseries of The Dead Zone, starring Anthony Michael Hall as Johnny, which was first broadcast in 2002.